17th match of ICC Worldcup 2015 has been played between Afghanistan and Scotland at Iniversity Oval, Dunesin today. In a heart beating game Afghanistan won the match by 1 wicket with 3 balls spares to bowl. Samiullah Shenwari (Afghanistan) declared man of the match for his superb inning of 96 runs. Earlier, Afghanistan won the toss and put Scotland into bat first. Putting into bat first Scotland batsmen could not stood in middle for long and lost wickets in regular interwals. At enf of 50 overs Scotland managed to put 210 runs on board for Afghanstan. MW Machan and RM Haq were top scorer for Scotland. Both contributed 31 runs each. 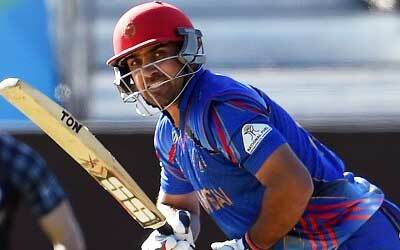 Following target of 211 runs, Afghanistan got good start with Javed Ahmadi and Nawroz Mangal. Nawroz Mangal got out scoring 7 runs and next coming batsman Asghar Stanikzai also out early scoring 4 runs. Afghanistan were in trouble but, Samiullah Shenwari took the charge in hand and played superb inning of 96 runs and gave Afghanistan 1st ever win in Worldcup by 1 wicket with 3 balls remaining.